THE Government moved to reassure parents last night after it was revealed more than 20 babies died or were brain damaged in secret whooping cough vaccine tests. Thousands of babies were used in the NHS experiments in the late 40s and early 50s without their parents consent. Over 1000 came from Tyneside alone. The vaccine had not been tested before and health chiefs have only now admitted the trials took place, between 1948 and 1956. The discovery was made after the Vaccine Victims Support Group called for a Government inquiry into damage caused by vaccinations. An all-party parliamentary group, led by Eccles MP Ian Stewart, compiled information on all vaccines used in Britain. Reports of the 1950s trials were among these documents. Mr Stewart said, "It appears a trial was being conducted without parents consent. Families should have been warned the drug was in early stages." Families hope this new evidence will help in their fight for compensation to help look after loved ones. "Children were used as guinea pigs." 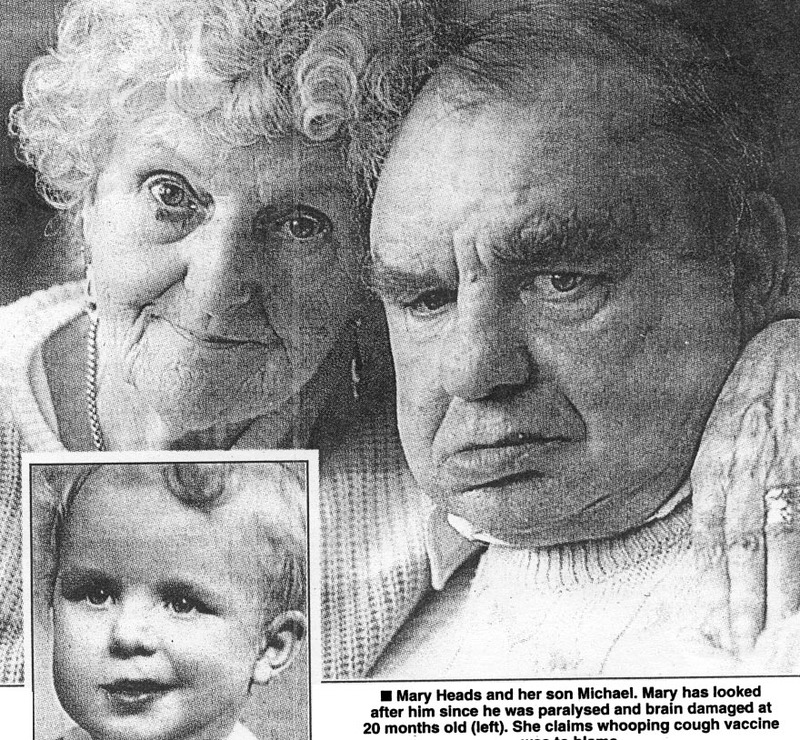 Mary Heads (79), from Gateshead, has spent the last 50 years caring for her son Michael. Despite being fit and healthy until he was 20 months old, just hours after being given whooping cough vaccine he became feverish an started to have convulsions. Doctors said it was unlikely Michael would survive but after eight days in a coma he pulled through. He was left paralysed down his right side, severely brain damaged and with epilepsy. Mrs Heads said, "I have never been given so much as l0p to help look after Michael. Now we are told the drug hadnt been tested properly and our children were part of an experiment." But a spokesman for the Department of Health said he did not think bringing the issue up was "beneficial". He said, "We are talking about trials 50 years ago and it is important to recognise things which happened in the past would not happen now."